PJ had fun flying the flag. Some of the participants in the AHCA trail challenge were asked to pick up the flag and take a lap around the arena. With 13 different obstacles to complete in only 8 minutes, there isn’t a lot of time. PJ is hurrying to make his lap and move to the next obstacle. The 16th Annual Charity Trail Ride registration starts at noon today at Dripping Springs. The guided ride starts Saturday morning at 9:00am. The cost is $35 per rider, but the ride is for a good cause. Proceeds from the event will go to Prevent Blindness. There are estimated to be 125 to 150 riders. The trail ride is held every year to raise funds for a worthy cause. Will Your Horse Do This? One of the obstacles at the trail challenge was the box platform shown in the photo. The horse and rider teams in the Open Division were asked to stand on the platform as depicted here. The Amateur and less experienced contestants were expected to have the horse put both front feet on the platform for 5 seconds. 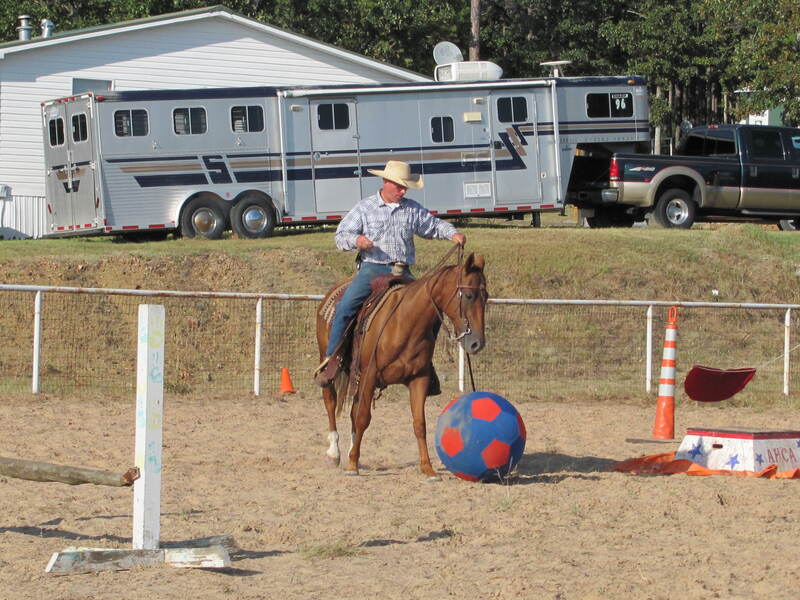 This is a photograph showing Chex learning to play soccer at the trail challenge held by the Horsemen of Arkansas. He had a ball (pun intended). Actually the first time he approached the ball, he didn’t like it. Having never been to a trail challenge, he really didn’t think the soccer ball was interesting enough to want to touch it. 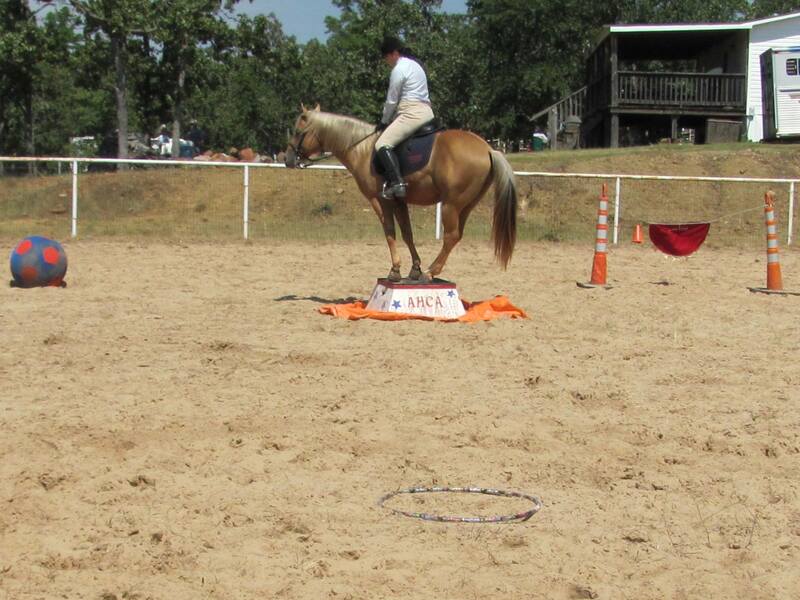 This particular obstacle required the rider to approach the ball and push it with the horse in a circle around some of the other obstacles on the ground. The wind was blowing and gusting quite a bit so the ball didn’t always roll straight. Depending on the direction, it would blow back against the horse. 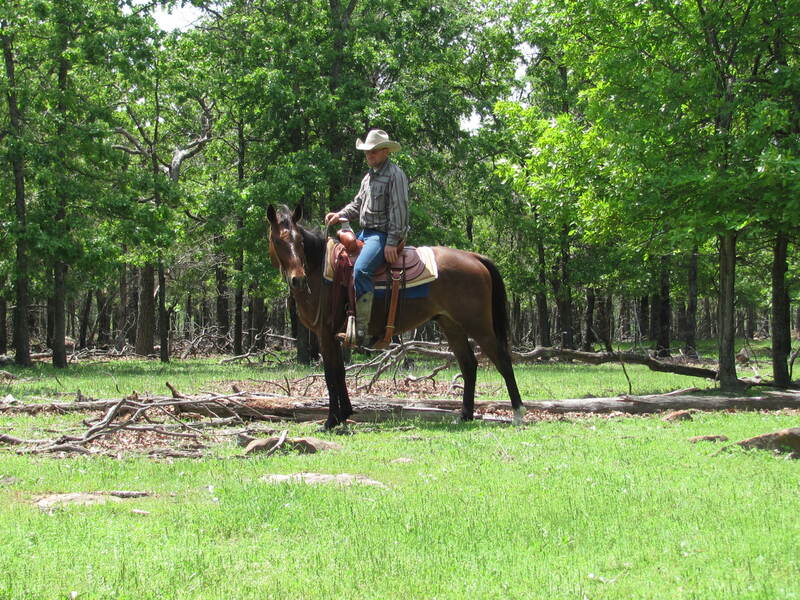 We really like this little AQHA gelding because he learns really fast. By the time he had been over the course twice, he was willing to push the soccer ball. He just needed once or twice to understand what was expected. The rules don’t allow any horse on the obstacle course before the competition begins so the objects are new to the horse. The riders on the other hand are allowed to walk the course prior to the start and look over the course. PJ is shown at his first trail challenge in this photograph. 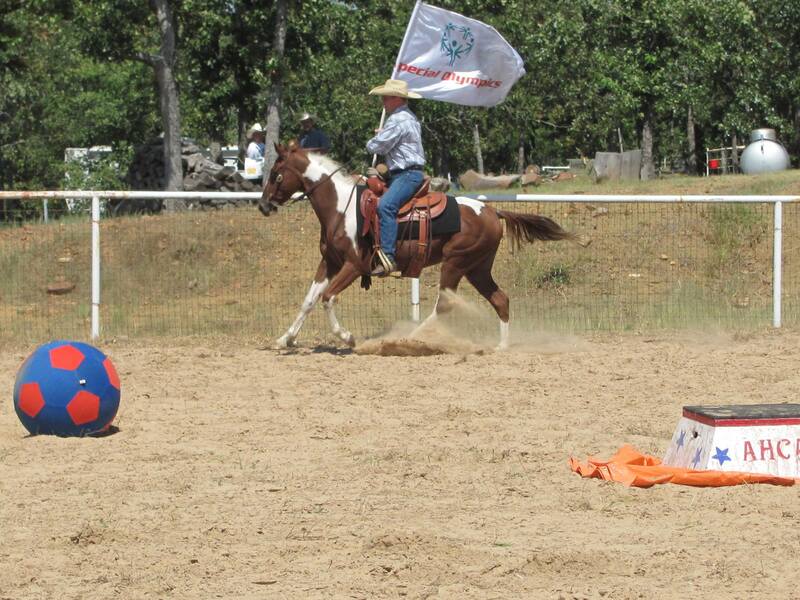 The obstacle challenge was held at Horse Heaven Ranch and hosted by Horsemen of Arkansas. One obstacle required riders to pick the pole and ride to the small circle on the ground. The rider then had to take his horse in a circle around the the pole. Once finished the rider returned the pole to the fence where he got it. One of the reasons we like the trail challenges is there always some obstacles that are simpler than others. PJ is still a relatively young horse and the obstacle allowed him to succeed and gain some confidence. The trail obstacle challenge hosted by the Horsemen of Arkansas at the Horse Heaven Ranch in Talihina, Oklahoma over the weekend was a great time. We will post some photographs later in the week and give some more details. The event went really well and the Horse Heaven Ranch was a wonderful location. The folks that run the place are friendly and keep the place up really well. The obstacle course was set up with several levels of competition for all ages and all skill levels so everyone could compete in competition suitable for their experience and ability. The judges worked hard and helped make the event a success. The super resourceful people with the Horsemen of Arkansas went to a lot of effort to bring the challenge into Oklahoma. It is so much fun to take your horse and see what you can do with him. Sometimes you are surprised by what the horse is willing to do. You can also find yourself wondering why he won’t do something that he just did wonderfully last weekend. At the end of the day, the people who attend and participate make all the difference. We like the competition, but just can’t say enough about the friendly and helpful nature of the contestants. Over and over we observed competitors lending a hand to fellow contestants, loaning equipment, and working together in every aspect so the best horse and rider team could win. The whole atmosphere is centered around everyone being able to do their very best with the collective help from the group. The Horse Heaven Ranch made a beautiful venue with the national forest in the background. There were lots of trails to explore in the off time. We managed to get there early enough Friday to spend the early evening taking a trail ride through the pine trees. We’re telling you that if you have never done one of these AHCA challenges, you’re missing out on lots of fun! Here’s some more video of our AQHA gelding, Chex, that will be for sale next year when he completes the two-year training program. Experience teaches lessons that nothing else can accomplish. This is true for horses and for the people trying to train the horse. One of our goals is for every trail horse graduating the two-year program to rapidly de-escalate from high anxiety levels back to calm. We want horses who may be initially surprised by unexpected circumstances to move through the initial emotions of fear and panic to the trained state of quietly waiting to see what will happen next. Just like horses, we also learn from experience and develop new thoughts, ideas, and training methods. In years past, if a horse became excited or wanted to run, the thought was to let him get it out of his system. Run him till he wore out. It often worked and wasn’t necessarily a bad idea. But, we noticed it didn’t work as well with some horses as it did others. Our present view takes into account the personality of the horse more than we used to do. Some horses like excitement and adrenalin, just like some people thrive upon it. A horse that wants a little drama will look for ways to create it. Unfortunately, the search for adventure and desire for excitement doesn’t fit well with our goal of calm and quiet. It is exactly the opposite of what we want. Bear in mind that some horses just aren’t suited mentally to make a good trail horse. We aren’t discussing those right now and cull the ones that are simply too high-strung. The horses we are addressing are the ones that have the mind and emotional stability, but just like a child or a teenager go looking for thrill and excitement. Once you get past the juvenile phase, the horse often makes a wonderful trail companion. These horses by nature tend to be less afraid and actually enjoy exploring new trails and seeing new sights. Our approach to these fun-loving personality types has changed considerably. We no longer let them run until tired and worn out as was the practice in the past. Unfortunately, it prolongs the behavior and takes longer to overcome what becomes a habit or a pattern. Just like a teenager, the horse is growing and developing stamina which means the horse can run farther and go longer. So the silliness continues for a longer than what is really necessary. Now when a horse finds something to “get excited” about, the approach is decrease the elevated level as quickly as reasonable. The concept is for the horse to be bored with his new-found adventure, therefore no longer fun. So far, it seems to be reducing the time it takes to teach a horse to go “back to calm“. This is the term we use to describe when a horse has reached a heightened level of anxiety and returns to a relaxed and quiet state. The faster the horse will go “back to calm”, the more control the rider has when the unexpected happens. With the new approach, the adrenalin doesn’t reach as high a level because we aren’t pushing the horse past his own natural excitement by encouraging him to run. The resulting physiology of running creates an increase in heart rate that means it takes longer to get “back to calm”. In summary, it takes two-years to develop a sound, quality trail horse and a life-time to develop the two-year training program. Maybe we’re just slow learners! Buying a horse is a financial decision that should make sense. But,we watch people buying horses and sometimes wonder what they were thinking. Here’s a perspective that is often overlooked by new horse buyers. A “free” horse costs just as much for hay, grain, wormer, vet bills, and miscellaneous expenses as a $25,000 Will Howe “dream” horse. At first blush, the “free” horse would appear the better financial decision. For sake of discussion we will assume the “free” horse is healthy and not part of the reason for the price. Unless you are truly fortunate (and we talk with a lot of people who apparently aren’t), the “free” horse will likely cost as much or more than the $25,000 horse. No, we haven’t been drinking the high-powered cough medicine. But, we have observed a number of horse owners for several years and gained some insight from it. A horse will consume 26 round bales per year. At $45 per round bale, this means your horse will cost $1,170.00 per year for hay excluding waste from weather and equipment handling expense. Wormer four times a year will cost $50.00. One vet visit with vaccinations and Coggins $200.00. These are all conservative figures not taking into account board, grain, and other expenditures. So $1500 per year is an extremely conservative estimate. Over five years ($1,500 x 5 years), you spent $7,500 whether you ever saddle the horse or not. We will assure you our maintenance per head isn’t that low, but maybe you run a more efficient operation. The $7,500 you expended doesn’t take into account training expenses if the horse is going to be ridden. All these expenses except the training start the moment you bring the horse home. Our question is why would you spend $7,500.00 caring for a horse you can’t even ride? If we were going to spend that much for maintenance for an animal, it is going to be one that can be used and ridden. Maybe we’re just cheap, but if we take on this kind of financial responsibility, we want something for it. We want to ride the horse! If you are looking for a horse, give some thought to making it a good financial decision. Horses generally aren’t a good investment in terms of saving for retirement. They can be a wonderful investment in years of fun, good times, and lasting memories. We want to help you see that paying good money out every month for a horse that you can’t catch, saddle, and ride is not a good financial decision. In fact, it makes just as much sense as buying a boat without a trailer that you keep in your backyard. If you can’t afford the trailer and the gas to go to the lake, you really don’t need the boat to be honest about it. If you average the up front purchase price for a well-broke and already trained horse and spread it out over the time you own and ride, the initial expense doesn’t add all that much to the monthly cost of ownership. A $25,000 horse averages $5,000 per year over the five-year example we used. A sound horse without a lot of age will hold most of its value if you take proper care of it. Assuming you want to enjoy yourself and ride, the relatively small depreciation of your horse growing older is minimal. Many people buy what they think will be a cheap horse that ends up at the trainer for 90 days to six months. The training charges run anywhere from $600 – 800 a month. So they spend $3,000 to 5,000 on a mount that may not even have the mind and disposition for a quality trail horse. The vet bills and expenses don’t stop just ’cause you take the horse to the trainer. Folks end up spending far more for a horse they can’t ride than if they had gotten a quality trail horse from the start. They could buy and ride the $25,000 horse for two years, sell it as an emergency fire loss for $20,000 and have spent less than the “free” horse someone “gifted” them. Give some thought as to why you want to spend more for a horse you can’t ride than for one you can enjoy. If you are buying a horse to ride, use, and have fun owning, then don’t waste your money by trying to cut corners. Penny wise can be dollar foolish! By the way, if you need a boat for your garage, we got a buddy with a bass boat that saw the lake twice last Summer. Ah, it’s barely September, he still might get it to the lake this year! The trail challenge at the Horse Heaven Ranch is bound to be a lot of fun and a great place. 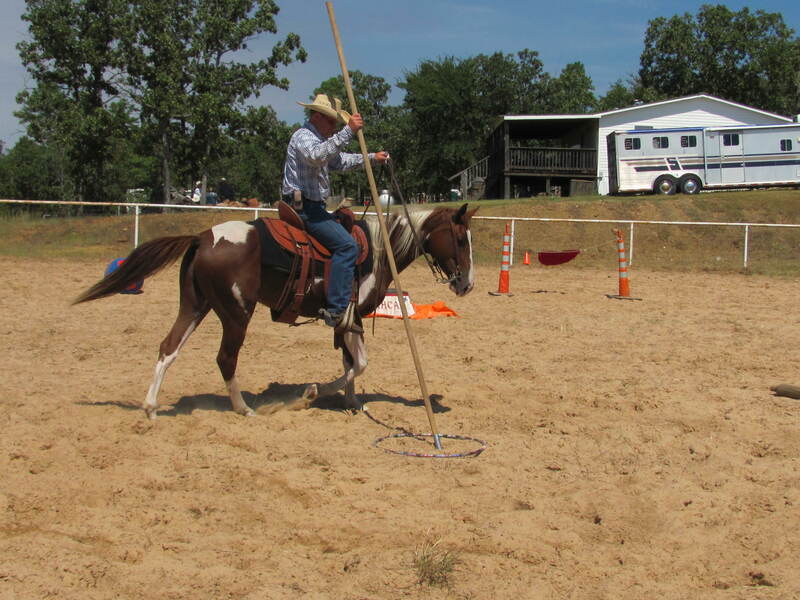 As previously reported, the Horsemen of Arkansas are holding a trail challenge sanctioned by the American Horsemen Challenge Association September 14 &15, 2013. We called Horse Heaven Ranch to make reservations and want you to know they are super nice and helpful. Elfie, who assisted us with reservations, stays on top of things and wants to make sure everything is just the way you want it. We were slow in getting to back to her. She doggedly followed up to make sure things were set up for us. If you haven’t made your reservations, you need to get in touch with Elfie at 254-289-2242 or equineempress@yahoo.com. Don’t forget you also need to register on the web page for the Horsemen of Arkansas. The photo shows Chex ground tied. When you drop the reins, he stands with his head down and waits for you to do your stuff. 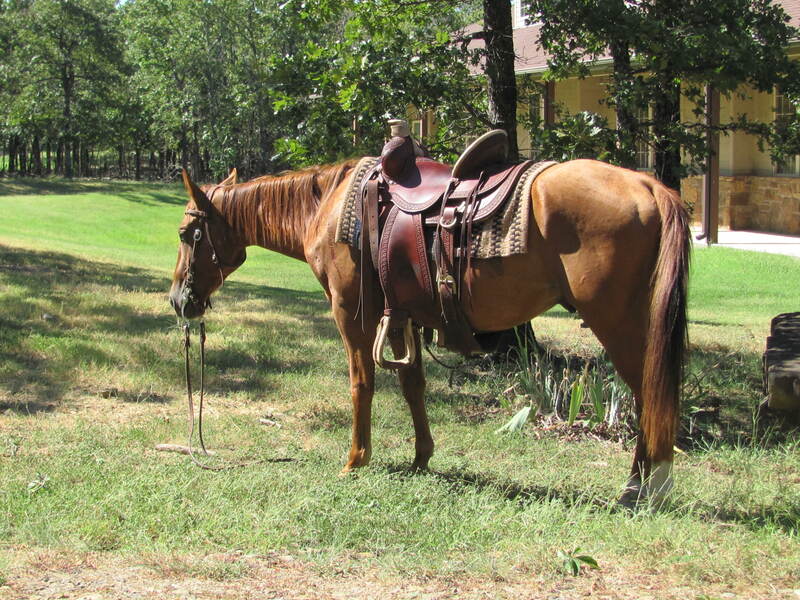 He’s an AQHA registered gelding about halfway through the two-years of training we give. The patience you see is what we try to foster. It comes from his genetics, natural disposition, and many hours spent in training. We promise you that he didn’t learn to do this by himself. It was taught. With hard work, you can promote patience in a horse. The willingness to stand quietly is refined and produced by practice and repetition. In a trail horse, patience is more than a virtue, it’s a requirement. This video shows Chex helping with some yard work. We had some small trees that died from the drought and needed to be removed. The green in the video is poison ivy. Funny, no one wanted to be the one dragging it off. Work around the place can be a great way to train your horse and get the chores done. But, I gotta find a camera man who doesn’t editorialize! LOL! See for yourself. You are currently browsing the horsesfortrail blog archives for September, 2013.